Since we started Dragons 5 years ago we have gained a lot of experience on how to get the most out of the sport of lacrosse for our athletes. We have taken young boys from 4th grade all the way to high school, with many making Varsity at their respective schools as freshmen. We have transitioned more players from the youth ranks into Loyola (#1 in LA) and Harvard Westlake (#3 in LA) than anyone else. And we helped get our entire active class of 2018 players recruited to play in college. Congratulations boys and good luck in the next phase of your life! The experience we’ve gained since our early years allows us to create programs that provide players a path from youth lacrosse to the college ranks. And as we enter the Fall/Winter season, we want to provide parents with a more comprehensive overview of the year ahead, rather than just tryouts and a schedule for the upcoming season. We believe that having an overview makes it much easier for parents and players to make decisions. At the core of all the success we have had at developing young boys into outstanding young men, athletes and lacrosse players, is a training program we believe to be the best in town. Over the years we have held specialty clinics with Zach Greer (Duke, MLL, NLL), Brendan Fowler (Duke, MLL, NLL), Greg Gurenlian (Penn State, MLL, Team USA) and Kyle Harrison (Hopkins, MLL, Team USA). All of these clinics were set up for our players specifically. We weren’t just a feeder into an existing session. And we are the only program in LA with an official relationship with Lacrosse Masters, the premier Prospect Camp series in the nation. We also have a new partnership with MadLax that provides our players with preferred access to guest play opportunities on the East Coast for all age levels, as well as spots on the MadLax National Team that competes in exclusive National Lacrosse Federation, the most competitive club tournament series in the nation. But at the core of it all is our day-to-day training. We typically offer more training time than other programs in a given season and we have more coaches and more experience on the field. In fact for the last year we’ve been overstaffing our practices to make sure coaches are rotated to get to know all our players and so they coach at the appropriate levels. This has led to 3, sometimes 4 coaches at a single team practice. We raised the bar years ago when we introduced an all-professional coaching staff in our area, and in the last two years have managed to keep the quality and consistency very high. We have a core roster of 14 coaches and expand to over 20 during peak season. Our coaches are knowledgable, experienced, they are passionate about lacrosse and love teaching kids. Maybe most importantly, our coaches bring an infectious and positive energy to the field that makes lacrosse and learning fun. And they know our players. If you’ve played high school with us, then you will also know that our coaches frequently suit up and jump into drills with our players. And of course they are not shy to help our players in the recruiting process. Click HERE to read about our coaches. The primary change is that we are separating training and tournaments this season. We will host an orientation meeting on Thursday, October 18th at the Main Library in Santa Monica in the Community Room (click for details) from 7:30-8:30pm. You must have a Training Membership to play tournaments. You can have a Training Membership and not play tournaments. Each tournament roster will capped at 18-20 to maximize playing time. You can choose to play as few as 1 and as many as 5 tournaments. We will only attend those tournaments at which we have committed rosters. Speed & Agility: A little bit of this is done every time we hit the field. But our goal this Winter is to create more of a sense of urgency in regards to this type of training. Size, speed and strength all matter once a player enters high school. Speed & Agility are a big part of getting ready for that environment. We will integrate as much Speed & Agility into our session as possible since we now have a certified in-house instructor: Lyndsey Munoz. We are also working on setting up an affiliate program with a specialty gym and hope to make an announcement soon. The cost of participation in an affiliate Speed & Agility program is NOT included in the Training Membership. The membership fee does NOT include tournament cost. The tournaments range from being moderately to highly competitive, so the intensity of the season ramps up as it goes on. You will also notice that there will most likely be no formal practices prior to Battle at the Balloon. This is pretty much how we’ve been doing SB Showdown the last few years. Some people like this approach, others don’t. We’re giving you the option to decide. The tournament registrations are what we call “waitlist registrations.” When you register, you will automatically be placed on a waitlist. You can register but you will not be charged. We do this because the tournaments are participation dependent. And if a roster is over-subscribed, we will need to make cuts. Registration Deadline: Thursday, October 18th. Same thing as the pre-season clinic, just at the end of the season. Schedule: The schedule has been posted on TourneyMachine. Click HERE to view it. Field Map: The field map is not yet available for this tournament. 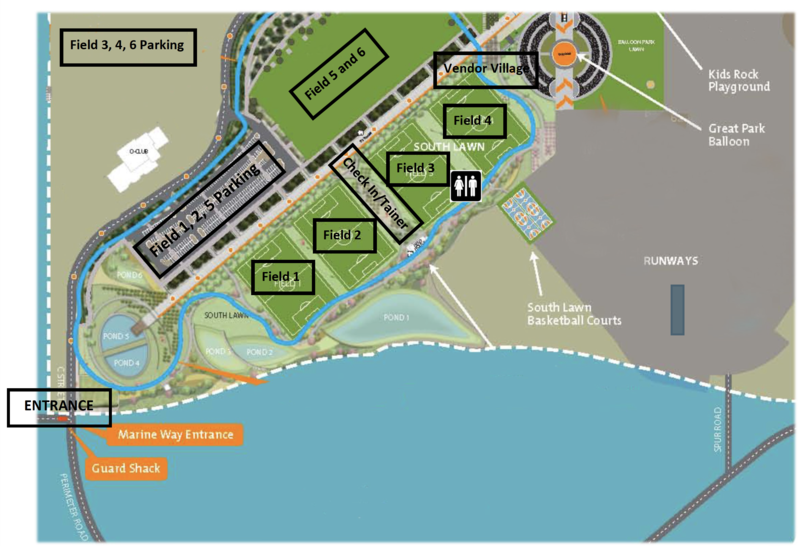 Due to construction at the OC Great Park, there will be 2 locations this year. Please check the schedule for your game location. The schedule is live HERE. The Airstation Shootout uses TourneyMachine. For instructions on how to use the app please click HERE. Field Map: The field map can be viewed and downloaded HERE. A hotel stay is not required for this tournament. You will need to register your player and complete the online waiver. Click HERE to complete the online waiver. Schedule: The schedule has been posted on Tourney Machine. Click HERE to view it. Field Map: Click HERE to download the field map. We will not have a room block in Santa Barbara. It is notoriously difficult to get hotel rooms. Click HERE for a list of hotel rooms with negotiated rates. Yes, the rates are high, but that is actually cheap compared to what the rooms cost without the special rate. You will need to register your player and complete the online waiver. We will send out an e-mail invitation to do so the week of the tournament.